The most frequent topic of these claims is immigration, which came up 24 times. Other frequent topics are biographical record (17 claims) and jobs (17 claims). 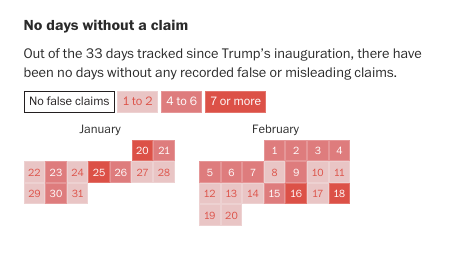 The most common source of false claims was Twitter, but there were also plenty in other remarks, prepared speeches, and interviews. Will that affect Trump’s political future? Perhaps less than you might think. In a Fox News poll conducted earlier this month, 45 percent of people said they trust his administration more than the media to tell the truth to the public while 42 percent said they trust the media more. That distrust of the media coupled with Trump’s aggressive efforts to discredit the press make stats like those above irrelevant to many of his supporters. It is understandable why Donald Trump has been attacking the press, including calling the news media an enemy of the people. While this is having some success, polls have also been showing a drop in support for Trump.